Taken in Bauan in 1901. Image source: Arnaldo Dumindin's Philippine-American War, 1899-1902. We continue with this site’s series featuring historic and folkloric trivia about the barrios of Batangas, this time with focus on those of the Municipality of San Pascual. Because the town did not come into existence until the year 19691, the source documents2 for this article were filed under “Bauan” at the National Library of the Philippines Digital Collections. Readers will please take note that not all barrios of present-day San Pascual are included. Some of these were probably still part of old barrios and were not created until after the source documents were collected by the national government in 1953. It is also possible that documents for some barrios had become eroded by time and could be digitized. This barrio was established during the Spanish era, but nobody from the barrio at the time the source document was written could tell exactly when. The barrio’s name was supposed to have been taken from a tree that grew right in the middle of the barrio. I am unable, however, to find any references to any tree named alalum over the Internet. The barrio was supposed to have been settled initially by some 50 families and used to have two sitios called Pook ng Malunggayan and Pook ng Karo. Because Alalum is divided by a deep ravine from Barrio Palsahingin, during the rainy season people could not visit the town to buy prime necessities and had to wait until the water subsided. This unfortunate situation was only remedied when a stone bridge was built in 1917. In World War II, ten of the barrio’s young men enlisted to fight the Japanese. Of these, only one Emetrio Marquez survived, and he would become a sergeant in the Philippine Constabulary3. The other nine were presumed to have perished either in Bataan or in Capaz, Tarlac. This barrio’s name was supposed to have originally been Bayato, albeit the source document failed to explain what the name meant and how it changed. It was established in 1870 and had two sitios where “a good number of people lived.” The barrio’s original settlers were the Rosales and Castillo families. Over time, people from other sitios, who were being harassed by bandits (probably tulisanes), moved to the barrio where they built their houses close to one another as a defensive ploy against the bandits. During the Philippine-American War, one Lorenzo Panganiban, a colonel in the Filipino army, was tortured in the barrio at the instigation of the Macabebe Scouts4. During the Japanese occupation, civilians in the barrio were used by the invaders as slave labor. As liberation neared, the barrio’s inhabitants fled their houses to seek refuge behind American forces. Inhabitants of Bayanan were tortured at the instigation of the so-called Macabebe Scouts (above). Image source: Arnaldo Dumindin's Philippine-American War, 1899-1902. This barrio’s name was supposed to have been taken from the Tagalog word “danglay,” which the source document described as strips of bamboo used to make fish corrals called “baklad” in Tagalog. The barrio only had one sitio which was called Kamutain, and it was supposed to have been formed only after a big flooding that occurred in 1926. The original settlers of the barrio were the Velasquez, Contreras and Gabis families. Although the barrio folks were all previously Catholics, in 1938 many converted to the Iglesia ni Kristo faith when one Mr. Ortiz came to preach. Late in World War II, Danglayan was among the beaches where the Americans landed their troops as well as supplies. This was beneficial to the barrio because thousands were employed by the United States Army. This barrio used to be called Pook ng Sigay, but people kept marveling at the bamboo trees that lined the path leading to it that it was inevitable that it would be renamed Gelerang Kawayan, meaning line of bamboo trees in English. It was originally settled by the families of Severino Magbojos, Manuel Magbojos, Vicente Punzalan, Lazaro Punzalan, Severo Punzalan, Telesforo Boongaling, Benito Torres, Miguel Garcia and Hilarion Azucena. When World War II came to the Philippines, evacuees from poblacion (meaning the town of Bauan) and other towns such as Lipa fled to Gelerang Kawayan to live with their relatives. The barrio, though, was not spared from Japanese abuse; and many of its inhabitants were forced to leave their houses until the return of the Americans in 1945. This barrio’s name, as most everyone would have already guessed, was taken from the Tagalog word which means a creek. There used to be, according to folklore, streams of water during the rainy season which would accumulate in the ravines surrounding the barrio where naughty boys would swim. The barrio’s original inhabitants were wealthy families with the surnames Gonzales, Boo, Karaan, Aranas and Magbojos. As World War II fighting drew to a close in the country, young men from the barrio joined presumably guerrilla forces to hunt down retreating Japanese soldiers. Eight of these were killed in the barrio by its people, doubtless in retribution for their cruelty towards Filipinos. This barrio is, in the present day, in the poblacion area of San Pascual. At the time the source document was written, however, it was merely a barrio of Bauan. The name Lagnas was supposedly old Tagalog for creek. It had sitios named Kulong-kulong, Pook ng Balami, Pook ng Pani, Pook ng Butlag and Pook ng Dimatatac. The barrio was established circa 1852 when it was still heavily forested; and was initially settled by some forty families. A flood in 1926 forced the inhabitants of Kulong-kulong to abandon the sitio. In 1942, the Japanese invaders turned the barrio's lands into a cotton plantation. Food and livestock Twere confiscated by the Japanese, who also killed four of the barrio’s men. After the war, some of the barrio’s lands would be purchased by the Caltex Corporation5. Caltex Corporation set up shop in Lagnas. Image source: Ramon FVelasquez [CC BY-SA 3.0 (https://creativecommons.org/licenses/by-sa/3.0)], from Wikimedia Commons. This barrio was named after Dr. Jose P. Laurel, President of the Second Philippine Republic. It was formerly part of Bayanan but was formally established as a separate barrio in the year 1949. Its original inhabitants were the Marasigan and Azucar families. In the barrio’s early days, most of the houses in the barrio were made with bamboo and nipa, because these plants abounded in the area. This barrio’s name was supposed to have been given because there were large groups of houses built in it, as opposed to other barrios that were sparsely populated. The barrio was established during the Spanish era and had a sitio called Pook na Banal. Its original families were those of Estanislao Sandoval, Jose Marquez, Jose Perez and Justo Macatangay. In World War II, five Japanese soldiers occupied the house of Roman and Joaquina Robles. They called for a meeting of the inhabitants of neighboring barrios and “urged” everyone to plant cotton. They would go from house to house to wake the barrio folks up and instruct them to tend to their cotton fields. When the Americans returned to liberate Batangas, because they landed their troops on the beaches of San Pascual, many of the barrio’s inhabitants were employed as clerks, laborers and guards. Because the barrio was on elevated land, at least in contrast to the other barrios when San Pascual was still part of Bauan, then it was inevitable that it would be named Mataasnalupa. During the Spanish era, transportation was “inadequate” and the roads were bad. Thus, people could not really take their goods to poblacion (meaning Bauan) on a regular basis. When the Americans came, they built schools and encouraged parents to send their children to these. They also built roads, which opened the barrio up to public transportation such as those operated by the Batangas Transportation Company. During the Japanese occupation, the barrio’s inhabitants were also forced to plant their fields to cotton. 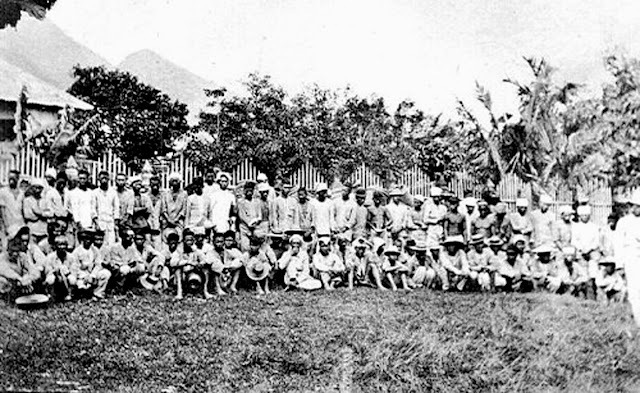 People of the barrio were taken to work as forced labor in Japanese projects in Lipa and barrio Ilat. Barrio Palsahingin was supposed to have been named after a tree that yielded a black or white resin used for medicinal or lighting purposes. This was probably the Manila elemi6, also known as the sahing or even more commonly as the pili. During the Spanish era, inhabitants of the barrio had to fetch water for their daily needs from a spring called Butlag, 2½ kilometers away. During the Philippine-American war, they were also forced by the US Army to live in a concentration camp at poblacion Bauan. When Japan invaded the Philippines, people of the barrio had to plant their fields to cotton and subsisted on root crops. Children had to quit school and adults were often taken to work as forced labor in Japanese projects. In 1945, when the American forces had returned to liberate the Philippines, a US Air Force7 headquarters was put up in the vicinity of Palsahingin. Palsahingin was likely named after the sahing or pili tree. Image source: Philippine Medicinal Plants. According to folklore, this barrio was named after its soil, which was hard and gravelly or, therefore, “pila8.” In the early days, probably during the Spanish era, there were just a few families living in the barrio. During the Philippine-American War, houses in the barrio were burned down by Filipino Soldiers fighting alongside the Americans. These were probably the Macabebe Scouts. Civilians were forced to live in concentration camps in poblacion Bauan or in barrio Lagnas. During the Japanese occupation, inhabitants of the barrio were forced to plant their fields to cotton and were only allowed small plots to plant food. Japanese soldiers periodically raided the barrio for produce; and the plight of the barrio’s inhabitants was exacerbated by Filipino guerrillas who would come from time to time to beg for food as well. Barrio Sambat was established during the Spanish colonial era. Its original settlers were the Magnayi, Agbay, Maquimot, Camacho, Malaso, Reyes, Aquilon and Marquez families. According to old folks at the time the source document was written, the barrio’s name was shortened from “pinagsambatan,” meaning intersection. This was in reference to a crossroads in the barrio, one branch of which led to San Jose while the other to Alitagtag. During the Philippine-American War, inhabitants of the barrio were also forced to live in concentration camps. In 1945, Japanese soldiers pursued and massacred civilians attempting to flee the barrio and burned many houses. This barrio was originally named “butuhan” after a banana specie which abounded in the place. It was later renamed San Antonio not in honor of any saint but after a former barrio lieutenant named Antonio Arano. The barrio’s original settlers were the families of Felipe Conti and Alejo de la Rosa. Its sitios were called Jipit, Tramo, Real, Hagonoy and San Antonio Proper. In 1916, a locust swarm destroyed the barrio’s rice fields. In 1925, because of a typhoon the Hagonoy River overflowed its banks, causing the flooding already mentioned in previous barrio histories, and destroyed a bridge spanning it as well. This barrio was named after a wealthy man named Mariano Aranas, a “capitan” during the Spanish era who petitioned the colonial government for a change of the barrio’s name from Dagatan. Its original inhabitants were the Dimayuga and Comia families. Just like in other barrios of Batangas, the inhabitants of San Mariano were forced by the Japanese in World War II to plant their fields to cotton. They did so for the three years prior to the return of American forces to liberate the Philippines. Cotton balls were weighed and a kilogram of these were purchased by the Japanese at a measly sum of ¢13. 1 “San Pascual, Batangas,” Wikipedia. 2 These documents are simply called “Historical Data” and can be found online at the National Library of the Philippines Digital Collections. 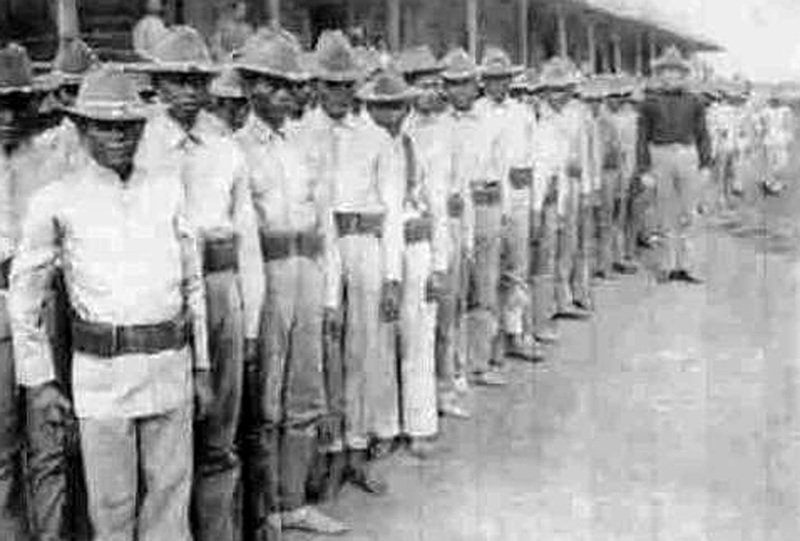 3 The Philippine Constabulary was the predecessor of the Philippine National Police. Wikipedia. 4 The “Macabebe Scouts” or “Philippine Scouts” were Filipinos or Filipino-Americans who were part of the United States Army Philippine Department. Wikipedia. 5 In the present day, Caltex Corporation is known as Chevron Philippines. 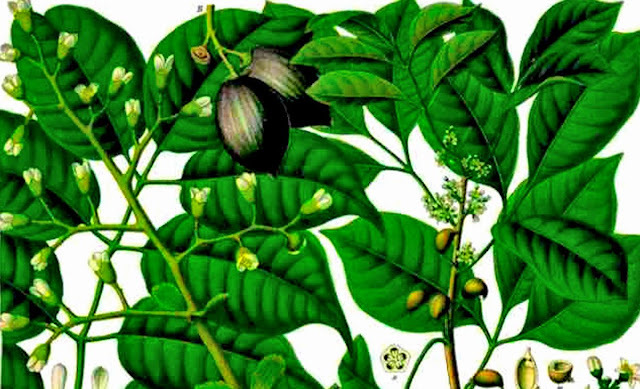 6 “Sahing,” online at Philippine Medicinal Plants. 7 At the time, the United States Air Force was still known as the United States Army Air Corps. 8 The word “pila” must be either archaic Tagalog or dialect local to San Pascual.